Why Global and Cultural Competency? The U.S. Department of Education’s (ED) International Strategy lays out its commitment to prepare all U.S. students to succeed globally through international education and engagement. Today, more than ever, our students need to be equipped with the critical thinking, communications, socio-emotional and language skills to work collaboratively with their counterparts in the United States and all over the world. Understanding and appreciating other parts of the world, different religions, cultures, and points of view are essential elements of global and cultural competence. 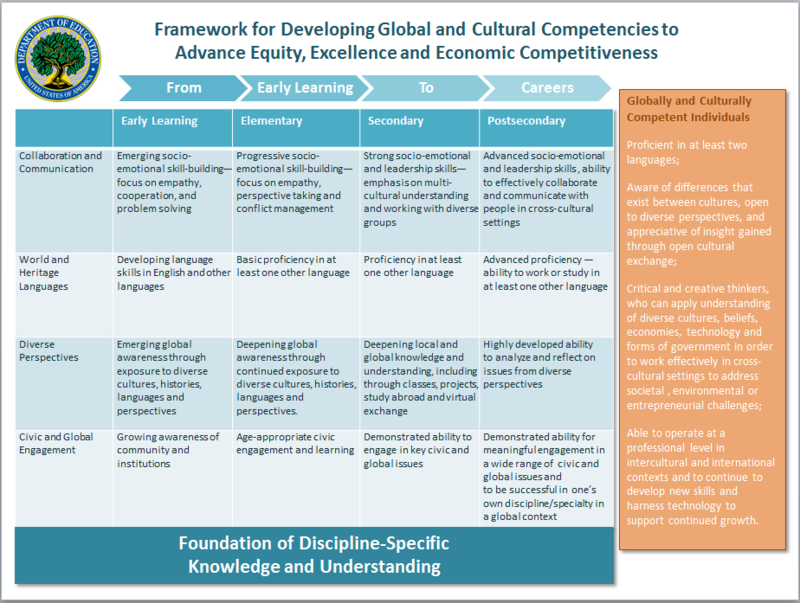 ED’s Framework for Developing Global and Cultural Competencies to Advance Equity, Excellence and Economic Competitiveness is the product of a working group with representatives from across ED and discussions with the education community. This work builds on existing research and provides a framework for the development of global and cultural competencies beginning in early childhood through postsecondary education and bases it on a foundation of discipline-specific knowledge. It is designed as a guide to consider how these competencies are developed over time and at various stages of education.